Please post your Sketchcrawl 37 - Oct 13, 2012 Sketches and photos here. 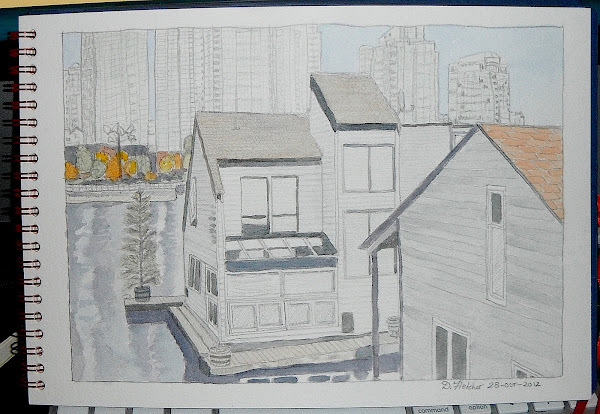 My aplogies for not doing a setup for the Vancouver sketchers, I have not done much sketching lately and have had a visitor this last week. I hope those who did organize themselves have fun and turn in some interesting sketches. In the times I was available i have spent them trying to keep spammers off this sketchcrawl forum. Spam got really ugly and annoyingly heavy for the last three weeks... Grrrrr. Hi Dave, sorry you haven't had time to sketch, but we all appreciate your time and energy clearing spammers off sketchcrawl! I was unable to attend Sketchcrawl 37 on the official day as I was otherwise occupied. 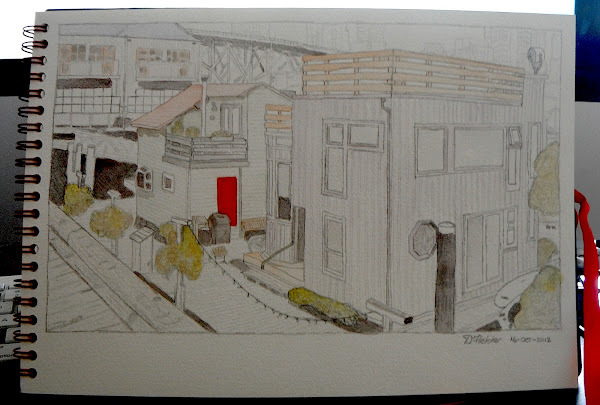 Besides, it was raining hard that day and therefore would have been miserable weather for sketching. I decided to do my sketches for Sketchcrawl 37 on Tuesday Oct 16th when the weather was much better. 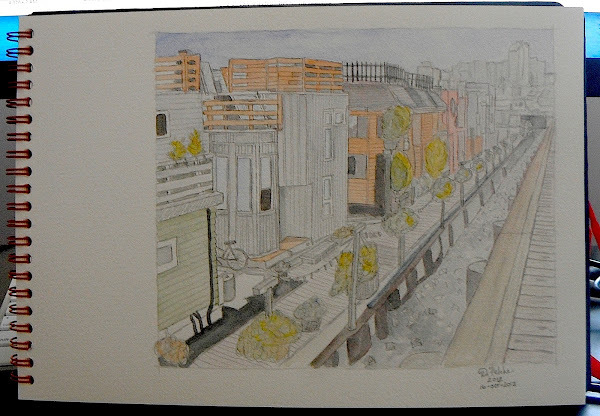 Since I had plans to pick up some supplies at Opus Art Store on Granville Isand, I decided to sketch the Sea Village of boathouses nearby on the island. Here are my pencil and watercolour sketches for the day. I was sketching solo and being a Tuesday it was quite quiet. I was able to sit in the sun on a choice of benches along the dock. So many straight lines here, gave me lots of practice doing manual line work. i did a light sketch in 7H pencil to get things sorted out and finished with a HB pencil and a light brushing of watercolour. 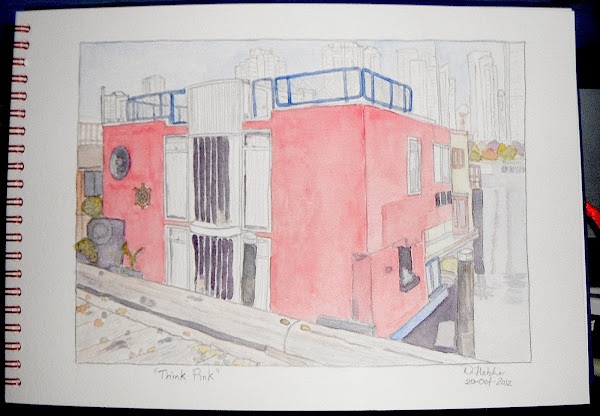 PS: I have tried out the Opus store brand of watercolour sketchbook and it works real well for me. They have done a great job with the hard cover, double-wire binding and ribbon close. The paper is 140lb/300gsm watercolour paper that seems to work well for sketching and takes a light watercolour application okay. The sketchbook comes in a clearview re-sealable bag which is nice to keep the water off the book when it is in my bag being transported. This is the smaller of the two sketchbook sizes available. Each sketchbook has 20 watercolour sheets. Thanks for the person-by-person comments on our post. The hat is by Alex Tilley, a famous Canadian! Best hat I ever had, wear it everywhere, it floats, does well in the rain, heat, cold. Good investment. Got it almost 8 years ago after a bad accident with an iron horse to protect my new face from the UV while the scars healed. Apparently it worked. And the hat still looks good, too. Not actually done for sketchcrawl 37 day but part of the same series I started with the sketchcrawl. Jeff's is a type of ivy. Roger's trees are Cypresses. We have two kinds, the Bald Cypress that usually grows along rivers and make hundreds of "knees" (sort of like roots that grow the wrong way, and are rounded at the top; scientists don't really know why they have these) and the Pond Cypresses also have knees but fewer; and they grow, well, in and around ponds. We have one lake called "Forest-on-the-Lake" that has more trees than water! Mark PS that red door is outstanding...really zings your drawing!